Jamaica loves a mash-up — from beaches to mountains, basic backpacker digs to chic urban hotels and chilled hospitality to high-octane vibes. And this mind-bending mix is a magic formula for adventure lovers. Slouching against the basketball court wall at Rocky Park, Harbour View, the skinny youth in bright mesh marina raises his Guinness bottle at a supple senior grinding to Popcaan’s ‘when you wind like that’ with the carefree swagger of a 16-year-old. I crack a comradely grin as the supercharged sound system cools the crowd down with Garnett Silk’s ‘Splashing, Dashing’ — Psalm 23 reclaimed as a Rasta anthem. Dedicated to DIY culture, Jamaicans have a habit of throwing the most unlikely ingredients in the pot to make your mouth water. Post-dance roadside entrepreneurialism is evident at the nearby roundabout as I clock my order of spicy jerk chicken sizzling in a recycled car alloy pan, while the chef retrieves an accompanying Red Stripe beer from an adjacent shipping container shop. Then, box food in hand, my taxi spins me to the genteel surroundings of Terra Nova All-Suite Hotel, where I’m staying for my last couple of nights in Kingston. This converted early 20th Century Great House was once the home of Island Records mogul Chris Blackwell. But its old-world elegance, fine dining and champagne cocktails now attract a trendy crowd of urban professionals, socialites, visiting diplomats and dignitaries. The previous evening, I’d tucked into chicken breast stuffed with callaloo in the Boho surroundings of Redbones Blues Café before cooling off under a mango tree to enjoy an acoustic set from local artist Kelissa. The bar’s organic indoor/outdoor vibe brings welcome respite from the capital’s hectic streets where (outside of sedate New Kingston) the collective bustle of close to a million inhabitants sparks a sensory blaze of sights and sounds. 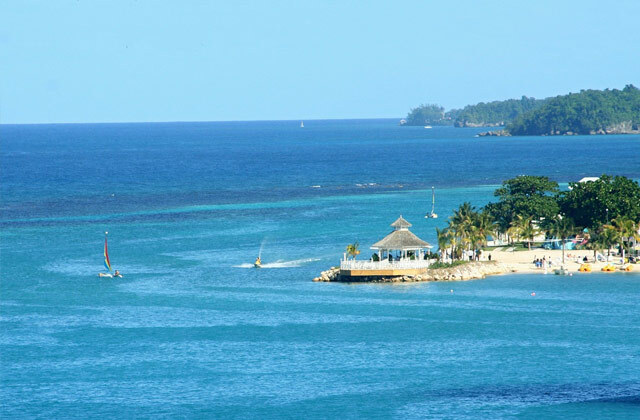 But if you want to experience what makes Jamaica unique, leave ‘town’ behind and plan a trip to the secret interior locations package tour operators won’t tell you about. Treasure Beach in St Bess (as locals affectionately call St Elizabeth Parish) is about 60km west of Kingston on the island’s south coast — but in terms of atmosphere, it’s a million miles away. Legend has it that a Scottish ship carrying refugees from the failed Darien expedition wrecked off the coast here at the end of the 17th Century —depositing survivors who were left with little option but to stick around, mix and mingle. The local dialect is peppered with Scottish phrases like ‘Aye’, ‘gie her it’ and ‘gallus’, inhabitants have red hair and blue or green eyes, and two ship cannons from Carron ironworks in Falkirk have been dredged from the bay — giving some credence to the seemingly tall tale. I stayed at idyllic Jake’s hotel, owned by Justine Henzell, whose late father Perry directed cult Jamaican gangster flick The Harder They Come. The boutique complex consists of a collection of private pastel-shade stucco villas with calming ocean views — it’s a favourite haunt of celebs like Johnny Depp, Jade Jagger and Kate Moss. The three-day Calabash literary festival is also held here in June on a biennial basis — and the intimate setup means you might share a rum punch with the likes of Salman Rushdie, Zadie Smith or Marlon James. Otherwise, yoga on the sundeck is about as energetic as it gets here — but if you want to unwind all the way, there are few better spots in the world. Accompong lies on the edge of the labyrinthine Cockpit Country at the northern edge of St Elizabeth. The verdant location is a mix of hills, valleys and hidden caves christened ‘The Land of Look Behind’ and the name of a remote community called ‘Me No Sen, You No Come’ hints at a historical period when ‘visitors’ weren’t assured a warm welcome. Accompong is a ‘state within a state’ in Jamaica — a semi-autonomous region that’s home to the Jamaican Maroons. This rebel army of runaway slaves deployed guerrilla tactics that forced the British Army to sue for peace in 1739 and won them independence and a tax-free status that are still extant. Sitting under the Kinder tree, where families of Maroons preserve Akan and Ashanti traditions possibly lost to their African homelands, my guide’s machete glints as he deftly chops up avocado and palms me it on a slice of brown bread. The town hosts a festival in January each year to commemorate the peace treaty — where tourists from around the world flock to witness traditional dancing, food and folk music that you’ll find nowhere else on earth. Jamaica’s national motto is ‘out of many, one people’, and a trip off the beaten path reveals the remarkable way its identity has been forged in fire to emerge bold, badass and beautiful. Simultaneously sophisticated, vibesy and blissfully laid back — nowhere works harder than Jamdown to ensure everyone gets together and feels alright.